eUnity™ SMIL PACS Viewer displays diagnostic quality images and is compatible with most commonly configured browsers on MAC™ or Windows™ PC, plus point-of-care mobile devices (iPhone, iPad and Android). 1. You must first have an activated eUnity account, a user name and temporary password. 2. To access eUnity using a mobile device you need to first log in through a desk top. 3. Type the URL https://eunity.sdil.net into your desk top browser. 4. Log in using your eUnity username and temporary password. Selecting “Log In” will prompt you to enter a new personalized password. 5. You will see a message stating "Invalid Username and/or Password" Simply re-enter your username and new password. •Visit the App store for your device to download eUnity and install the application. •To access with a mobile device begin by typing the server name eunity.sdil.net into the server section of the log in screen. The server name will automatically be remembered for future use. For additional assistance and troubleshooting, contact SMIL IT Support at 602.521.6373. Secure: When the web browser or mobile application is closed, all images and information are gone from the device and reside only on the server, ensuring a secure environment. No images are stored on the device. Easy to Use: eUnity™ is designed to be easy for busy clinicians to learn and use at the same time. 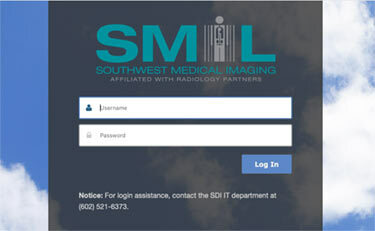 Immediate web-based access to diagnostic quality images and reports. Diagnostic Quality: Unlike other universal viewers, eUnity™ displays images at full-quality. When eUnity™ is used in your favorite web-browser on your MAC™ or Windows™ PC with an appropriate monitor for the pathology being viewed, it’s a flawless experience. Multi-Platform: Using your favorite web-browser and OS, eUnity™ runs on Microsoft Windows®, Mac OS® and Linux® in Microsoft Internet Explorer, Mozilla Firefox, Apple Safari and more. Mobile Devices: Enhance your workflows by leveraging eUnity™ Mobile in grand rounds, consultations, referrals and reference - extend the reach of your medical images to the point of care – wherever it may be on an Apple iPad, iPhone, Google Android or Blackberry Playbook.